Exchange 2010 was Microsoft's first version that removed the Single Instance Storage (SIS) feature in the datastore. The SIS was designed in earlier versions of Exchange Server to help improve speed of message delivery. Exchange servers would be deployed closer to where the users were located. So it was not uncommon for a company with five offices to have a domain controller and an Exchange server in each location. The SIS concept assumed that it would be faster for users of the local mail store and it would reduce the amount of required disk space on those servers as many users could all point to a single instance of a message or attachment. As Exchange Server evolved, Microsoft introduced more efficient methods of compressing data in the mail store, but was running into a problem with the size of the mail databases. They were getting so large that running indexing services on a large number of items degraded the performance of the server and Outlook clients. Exchange 2010 breaks out of the SIS model so that each mailbox is independent of the others, reducing the overhead on the indexing services and improving Outlook client responsiveness. So now another situation exists: instead of a single instance of a message there are now multiple instances. MS handles some of this by advanced compression algorithms, so many of the standard messages use just a little more than they did before. Therein lies the challenge with Rich Text Format (RTF) and attachments. RTF messages (HTML and plane TXT are the other format types) do not get the same benefits. Attachments are getting larger all the time, and cannot be compressed to the levels of HTML/TXT messages. This leads to the need for (1) additional storage; (2) additional backup capacity; and (3) longer backup windows. If your company has just over 100 employees, with Exchange 2007, if you sent a 10MB attachment, the Exchange server would store that message once using just over the 10MB (attachment + message size). In Exchange 2010, that message requires 1GB of storage. So think about organizations with hundreds or thousands of users. Did I mention that the 10MB attachment also lives in your home directory on the SAN? And that half the users you send the message to will save the attachment in their home directories (another 500MG required). One way to tackle this problem is by implementing a file sharing solution, such as Citrix's ShareFile. 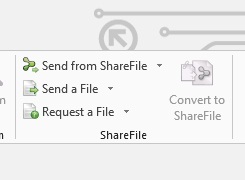 When Sharefile is integrated with Outlook, users can send links via e-mail to files on a SAN or on their local machines (Send from ShareFile in the image above), send file attachments (Send a File), or even provide a location where recipients can upload files rather than send them as attachments (Request a File). When linking to files, you have the option to set the level of security (none, name & email, or password) required for the recipient to access the data. With ShareFile's Outlook plug-in, you can also define policies, ranging from allowing users to determine when to send files via ShareFile to forcing all attachments through ShareFile. Your ShareFile directory location can also be synchronized to ShareFile cloud storage, allowing users outside your organization to access or upload files without actually connecting back to your environment. Reduce the cost of your Exchange server storage and network file share, and reduce the time to backup your data by implementing an enterprise file sharing solution like Citrix’s ShareFile. Your Exchange server administrator will thank you. For more information about Citrix ShareFile, check out http://www.citrix.com/products/sharefile/overview.html. Contact your Gotham Account Management team for additional information and pricing, and for information on Exchange and Storage architecture services for your organization.